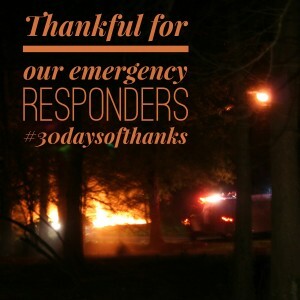 Thankful for Emergency Responders! - JP loves LIFE! In October, I made a list of topics for my 30 days of thanks posts. I had emergency responders on that list — you know, the men and women who answer our calls for help when accident, fire or crime strikes. Several times I have thought I need to write the post but I thought to myself, I need to research it more or I need to do this or that. Tonight as sirens wailed in the neighborhood, I knew I needed to do this now whether I researched it or not. There are times when it is abundantly clear…. we are truly blessed to have such great emergency responders in the communities I have lived in. For a lot of us, when we think of emergency responders, we think of TV shows and movies. We picture heroes heading toward or emerging from the flames or careening through the streets as CPR is done in the back of an ambulance or who guide you to safety when a hazard is ahead. These men and women are also the ones who help provide for our safety. They guide school children across the road safely and hold events where they will check to see if the car seat you just put in the car is secured properly. But so many of us also think of dear friends who dedicate their careers to the efforts that the rest of us count on when things go bad. Who work long hours, who miss holidays with loved ones, who come through for us and others in our communities time and time again. Many of those in rural communities are volunteers who farm, run the local gas station or farm supply store or whatever. They spend time nights and weekends learning the best ways to protect and serve. Today I am truly thankful for the people who look after our safety and health and who respond to the call. Please remember how much of a difference their ability to arrive quickly is and pull over if you hear a siren. If it was your family that needed the responders, you would want others to do the same. Why Sponsor a Hand Up? I like this one, JP! First responders are one group of special people. To be able to think fast in times of danger and stress is awesome. J’s Uncle is a professional fireman. J is on the local volunteer fire department, along with many area ranchers. We have 2 RN’s in the neighborhood and J’s Mom has had nurse training as well. Our small town clinic has a wonderful PA and 2 nurses. We are blessed to have good medical care in our rural area. There are so many roles to take on in hometowns! Glad yours is well set. At times in the Delta, it was pretty ugly. thank you so much for emphasizing the importance of recognizing our first responders. We often forget to show our gratitude towards them even though they risk their lives for us every day. I would love to add this post to the Gratitude Roundup taking place next week. Would you be interested? You can find the details here: http://bit.ly/1c6T7Dj. Thanks so much for highlighting this issue! Sure! That sounds great! I saw the piece earlier through Facebook and was trying to decide whether I needed to do something specific…. love that you think this one fits!